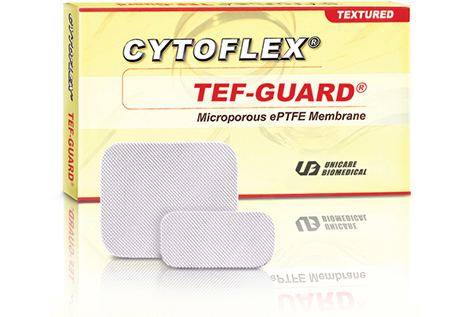 What is Cytoflex Tef-Guard ePTFE barrier membrane? Cytoflex Tef-Guard is an expanded polytetrafluoroethylene (ePTFE) barrier membrane composed of compact PTFE fibril matrices that is used for bone grafting procedures and as a space-making barrier in the treatment of periodontal defects. What are the advantages of Cytoflex Tef-Guard ePTFE membranes versus dense PTFE (dPTFE) membranes and first-generation ePTFE membranes? The compact PTFE fibril matrices of Cytoflex Tef-Guard ePTFE membranes allow nutrients to permeate across the barrier, while blocking bacteria and fibroblast penetration. In contrast, dPTFE membranes are made of solid PTFE material without fibril structures, which blocks both bacteria and nutrient penetration. The nutrient permeable Cytoflex Tef-Guard membranes help enhance tissue attachment and improve healing during bone regeneration. First-generation ePTFE membranes, made of Gore-Tex, were constructed of highly porous and loosely connected fibril structures. The high porosity of first-generation ePTFE membranes allowed nutrients — as well as bacteria and fibroblasts — to penetrate the membrane, which produced undesirable outcomes in some instances. As a result, Gore-Tex ePTFE barrier membranes are no longer available for dental applications. Can bacteria penetrate Cytoflex Tef-Guard ePTFE membranes and infect the wound site? Bacteria cannot penetrate the compact PTFE fibril matrices of Cytoflex Tef-Guard ePTFE barrier membranes. The bacteria-blocking properties of this third-generation membrane have been validated against high concentrations (106/ml) of the Brevundimonas diminuta bacteria (~1 micron in size) under extreme conditions. No bacteria penetrated the membrane after a week of incubation. Cytoflex Tef-Guard is predominantly used for nonprimary closure cases, and there have been no reported incidences of bacterial penetration. What are clinicians saying about Cytoflex Tef-Guard ePTFE barrier membranes? From Decisions in Dentistry. September 2018;4(9):21.